just completed this upgrade on my 91, looks great, and the gap up by the mirror was small and not very noticable. Great upgrade, easy to install. Wow this is great! $77 for sweeps at autozone, this will save me some bux! I am so glad this is helpful to you guys. Mine are still holding up great as well! I really like the smooth look of those but they look a tad big to me. If they could be scaled down to the same size of the 3rd gens then Id be all over them!! I got my 4th gen sweeps for $5.00 for both sides. use the flathead and pop off the plastic cover inside the car on the 4th gen side mirrror to access the 3 bolts holding the mirror on and the mirror will be out of the way and you can pop the sweep off with the flathead from outside the car CAREFULLY. I got mine off in about 15 minutes with the windows UP, no need to remove the whole inner door panel.. this was on a 96 camaro. Bradley, I think this is an amazing write up. Great job!!!!! I have a few things to mention, all in the name of helping others who may find this thread. Certainly in NO WAY intended to try to correct what you've done. No two cars are alike, so I'm just point out what someone else may need! Again, thanks for posting!!!! This was my go to reference for this project! ...first of all, I noticed that the OP, Bradley, certainly has slightly different doors on his 83 than I have on my 89. Especially the triangles! ...no worries though, 99% was correct (for me) and a the difference was no problem. I cut less off mine. Here's a pic showing all that I cut. Just a little of the visible section, and none of the lower portion where the screws go. From what I can tell, that section that bradley cut off in the first pic of post #6 was needed to run my last screw in! 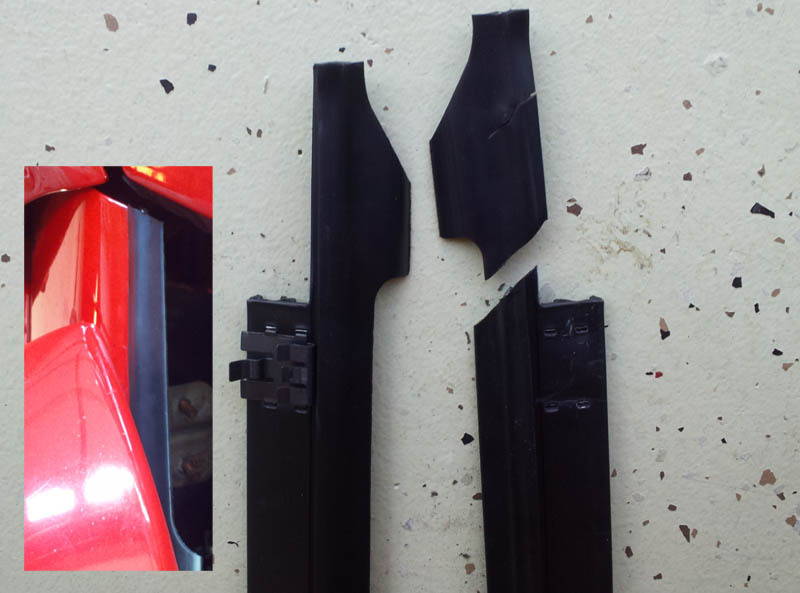 When I cut mine, I found I could make a cleaner cut with an exacto blade on the parts that were just rubber. The lip that actually sweeps the window, (yellow arrows) and the lip that lays over the door are just rubber. I made a nice clean cut with the exacto. The lower metal band, which your screws go through, (green arrows) and doesn't show, I used tin snips. 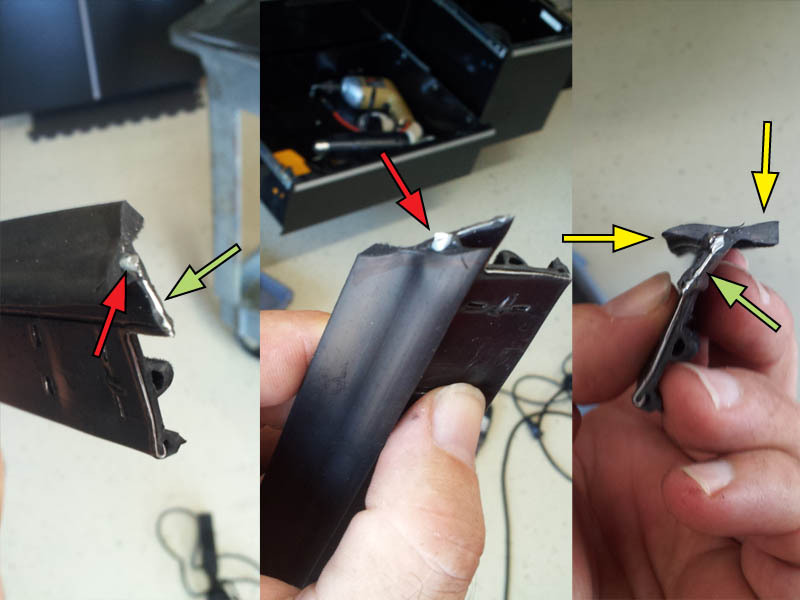 Then for the final hanger wire like metal going through the middle (red arrow) I just bent back and forth until it broke, and then hit it with a dremel sanding wheel real quick. You could just snip the whole thing, but I wanted to be sure it was REAL clean. I think I nailed it. Another thing. Valicswarrior mentions in post 25 about the gap. No one else in this thread had a gap. My friend did this on his Iroc, and no gap. I did my passenger side with no gap, BUT.....low and behold, I had an unacceptable gap in my driver side, due to a slightly differently adjusted triangle, which has to be aligned to the window, NOT the sweep, otherwise I woulda just realigned the triangle. You can see in the left/PS half how flush the fitment is. no gap. 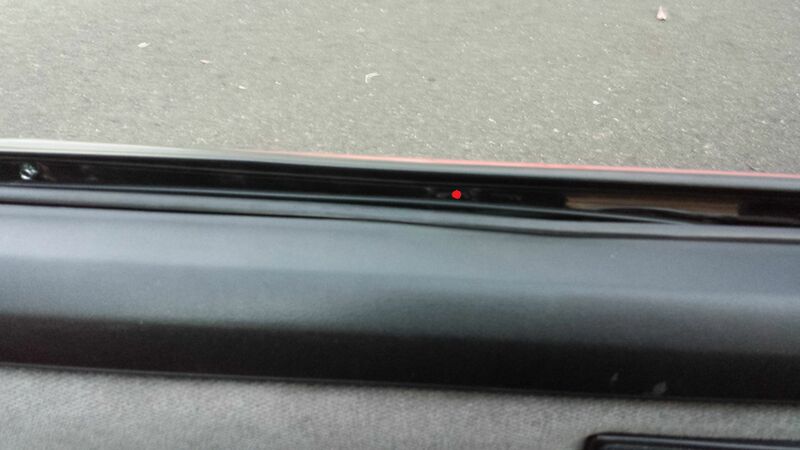 ...but on the driver side, you can see where I put weather stripping in there. I had almost a 1/4" gap!!! ...right down into the door! HAD to be fixed. That being said, you can hardly tell since it's behind the mirror. ya gotta be looking for it. Not an issue for me at all, but I wanted to confirm what he said, since I think everyone else thought he was crazy!!!! LOL!!!! ....and last but not least, one problem I had on the first/PS was that the rubber lip side that overlaps the door skin kept wanting to curl up underneath itself, it didn't want to sit flush. Once I got it, no problems, but it was a pain. 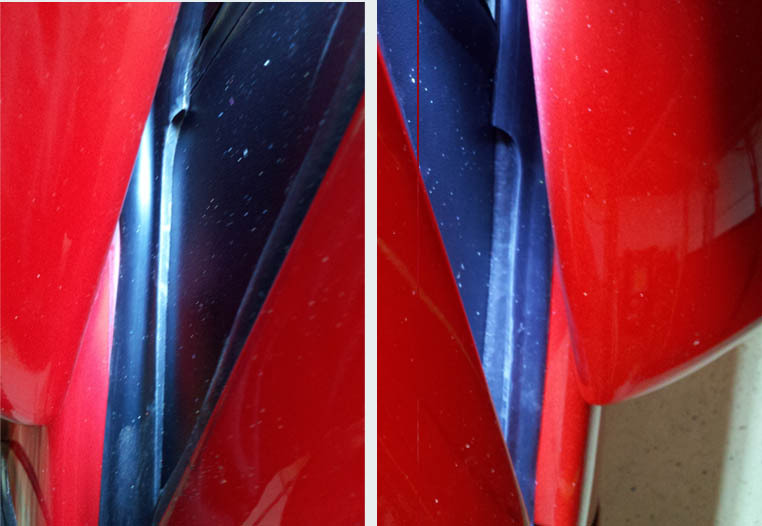 On the driver side, before i started, I ran some straight car wash gel across the leading edge of the door skin. No problems at all!!!! ...the rubber slid right into place perfectly! Thanks again for the right up!!!!!!! Last edited by Abubaca; 04-07-2013 at 10:00 AM. Talk about amazing timing. Getting new window sweeps from a vendor here was on the "to-do" list today, mine are craptastic. Saving money, don't mind if I do! I enjoyed doing the write-up, so no problem guys! Abubaca; Its true that no 2 cars are the same, and there are more than one way to do something. I really appreciate the added information on doing this mod, because it's something that I didn't 100% cover on my initial posting. I'm just glad that this has helped so many people put new sweeps on their car, adn save a bit of money in the process! Great writeup and a thanks to Abubaca for a little more info. I am a long way from there yet but assume mine need replacing. Saving this for future reference. My Camaro sweeps are fine but I have an '82 ElCamino in the garage that may benefit from this as soon as I get home to take some measurements. We need some type of "best of" thread for all these useful write ups. Great thread. I never even thought of this. Abubaca, could you put your photos back up? plan on doing this in a month or so and your addition is what i may need to see. Abubaca i dunno where your gap was exactly because the pics are down but my gap was where the glass to trangle seal is. i worked at mine by pushing it to the triangle and it seals but not tight. from what it looks like my pass side may turn out better. i'll tackle that one later this week. this time i'll go in reverse, i'll do up by the triangle first and work towards the back of the door. Sorry about the photos guys, I move the pics around sometimes and forget that some are linked into threads. They're fixed. something to help any gap issues, I found that the further down you pull the part of the sweep that you screw to the door the better it seals against the glass. you sort of rolling the seal inward towards the glass. roll too far and the lip tha sits on the outer body of the door will roll off and slip behind the door. I did this last year but didn't take the triangles off so they're not adjusted close enough to the sweep... Wish I would have seen this guide FIRST! Oh well I'm thinking new paint will require me to take them off again anyways..
Did you try mounting the curved up end first? That curve is visible on the pass. side pic. May make it easier to get it tight, then work the rest down as you go using the leverage of the extra length. Just a thought. The right sweeps are not all that pricey if you get them from rock auto. Never tried them, but certainly must fit better than trying to convert those. Last edited by Joe Tag; 04-10-2013 at 12:51 PM. Thanks! Nice writeup. Can I say sticky??? just got me a pair of sweeps off of a 97 camaro today for a total of $6 bucks. $2.00 to get in pullapart (need to get that vip card). and $2.00 a side. my buddy paid for the gas this trip so i could pull him a finder, pop up head light, and shifter for his 94 firebird. the sweeps were even laying in the back seat of the 4th gen someone before me took the interior apart for me so its just cleaning them up and installing. will post pics when the job is done. So i did this to my driver side door atm (plan to do the passengers too) but i noticed that when i tried to screw it in theres a part where its almost impossible to screw in. So right where the red indicates i need to get a screw in, Granted ill have the door taken apart again when i do it, but anyone got any suggestions? There were a few times I needed to predrill a pilot hole VERY CAREFULLY, since if ya go TOO far, it go into the backside of the door skin. I put the bit as far into the drill as possible so it wasn't too long. Axle/Gears: 2.73 L.S. - ??? Around here, it's standard procedure to remove batteries before putting a car on the lot. If the battery is good, they sell them from a different part of the lot. If not, they junk them. Take battery powered screw gun. Most are 12,18, or 24 volt. And just cut some wire and jump the window motor. I'm so glad to hear that my question from 2 1/2 years ago amused you so much. And like 58mark posted.....Salvage yards remove batteries as well as drain gas tanks. So walking around a salvage yardv will NOT get you a battery to use. I have never seen this before..thanks for the write up Bradley! 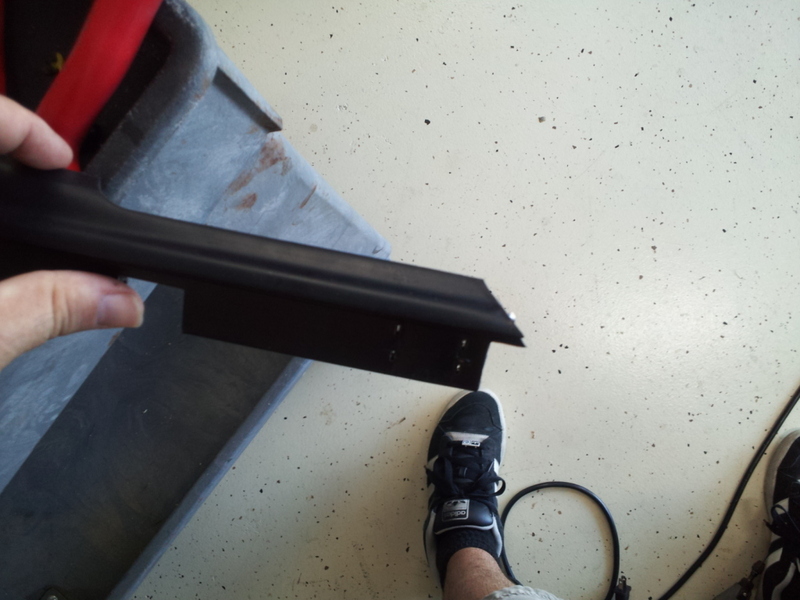 I just use a shop rag between the handle and the plastic bushing. Pull gently both ways... and if successful, the clip also stays in the rag. And also, thanks for the great post! I've never tried it like that, but I'd think you can break the handle. There are tools made to remove the clip, or you can take a piece of coat hanger and bend an 1/8th inch hook on the end to hook the loop of the horseshoe clip and remove it. Looks nice might do this also. What do these look like with the window down? I usually cruise with my left arm on the door, do they stick up at all? No, they do NOT stick up. In fact they lay over the window channel, making it MUCH more comfortable to have your arm there!!!!! !